WATERTOWN – It’s amazing how close the link is between our psyche and our health, and how events in a relationship – or events happening thousands of miles away – can play themselves out in health issues. 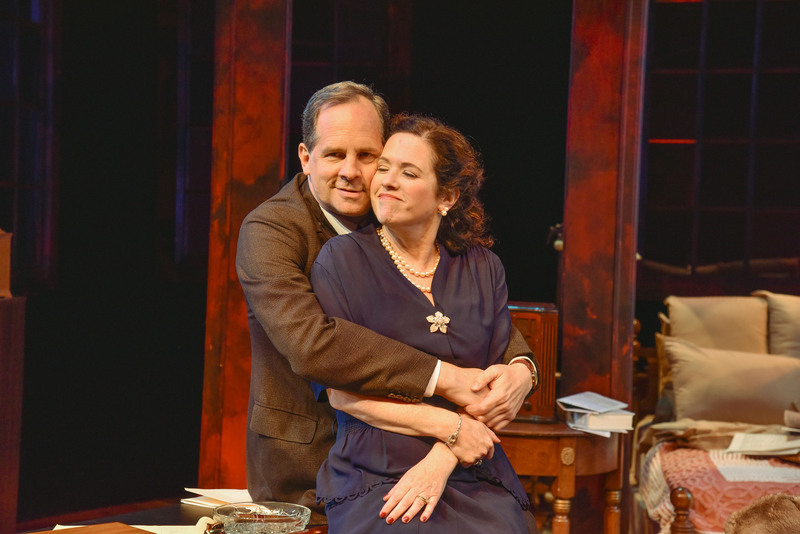 That connection is one of several themes explored in the New Repertory Theatre’s production of Arthur Miller’s 1994 play “Broken Glass” at the Mosesian Theatre at the Arsenal Center for the Arts. The play takes place in 1938 and refers to the infamous Kristallnacht of November of that year, the pogrom in which 30,000 Austrian and German Jews were rounded up and sent to concentration camps. It has another meaning – the Jewish wedding custom of the groom stomping on a drinking glass wrapped in a cloth, and the ceremonial breaking of that glass, and what that symbolizes for a marriage gone wrong. Miller wrote a series of timeless classics fairly early on in his career – “Death of a Salesman,” “All My Sons,” “The Crucible” and “A View From the Bridge” – but he remained active and productive for many years afterward. His final play opened in 2004, a year before his death, and his career spanned seven decades. The New Rep is presenting “Broken Glass” as part of a nationwide effort to recognize Miller on the 100th anniversary of his birth. New Rep artistic director Jim Petosa directed the Washington, D.C. area premiere of the play in 1996 and his familiarity with the piece has allowed him to hone in on the efforts of a fine cast. Phillip Gellburg (Jeremiah Kissel) – “It’s Gellburg, not Goldberg” – has come to the Brooklyn office of Dr. Harry Hyman (Benjamin Evett) over a very vexing matter concerning Phillip’s wife Sylvia (Anne Gottlieb). Her overriding interest in the plight of the Jews in Europe – and especially Nazi Germany — is discomforting, especially as it has coincided with her mysterious inability to move her legs. Into this situation rides – almost quite literally, since he wears riding boots much of the time – Dr. Hyman. who admits he’s not a specialist in this type of situation but agrees to help. He brings in another doctor, a specialist, and between the two they can find no physical reason for the problem. He quizzes Phillip on his relationship with his wife. It is apparent the Gellburgs have issues – long-term, deep-seated issues – that may be at the crux of the problem. He suspects “hysterical paralysis” and asks Phillip for permission to examine his wife. That becomes problematic, because conversations between Hyman and his wife reveal a reputation earned as a young man who had numerous relationships – something in my younger days we described as “swinging at every pitch” – and you have to believe that Miller intended the name to be an extension of the doctor’s sexual prowess. But Dr. Hyman’s treatment of Sylvia will trespass across the border of medical ethics, and complicate an already complicated situation. In “Broken Glass,” Miller will also explore the issue of Jewish identity through his characters. Miller by this point in his life had long since rejected organized religion and considered himself an atheist, although he retained his Jewish identity and often addressed anti-Semitism in his works. In “Broken Glass,” Sylvia is powerless to help the Jews being crushed under Hitler’s boot, and that powerlessness leads to a powerlessness of another sort – an inability to move her legs. Harry Hyman may be Jewish but he’s an admitted non-believer who has married a goyim – a decidedly Midwestern-nice woman named Margaret (Eve Passeltiner). And then there is Phillip Gellburg, who identifies as a Jew – when he wants to. Despite “Gellburg and not Goldberg,” he is proud of being the only Jew at his mortgage firm, and of being able to use the connections of his WASP boss (Michael Kaye ) to secure an appointment for his son at West Point. Jon Savage’s lovely, well-detailed set rotates and changes the action quickly from Hyman’s office to the Gellburg home. Ubiquitous sound designer David Remedios has become well-known not only for sound designs, but compositions of incidental music that add to the productions he works on. 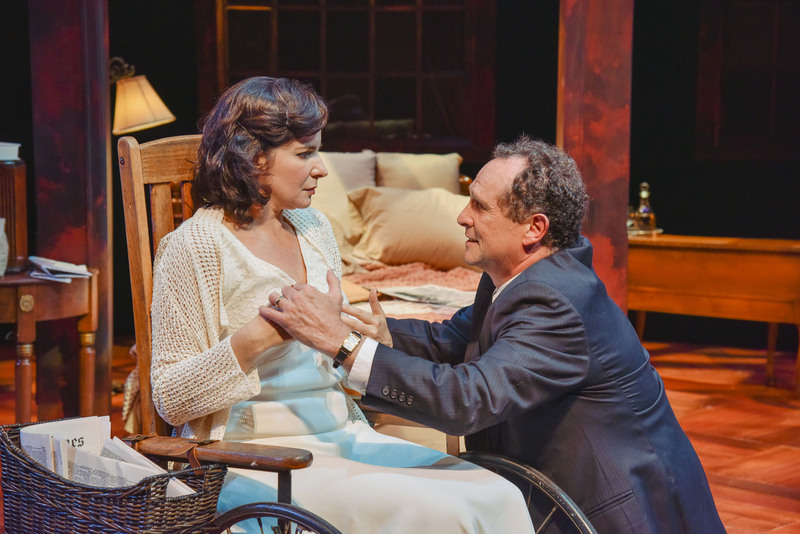 “Broken Glass” isn’t Miller at his finest – you can see the punches coming well before they land – but thanks to Petosa’s taut direction and a cast that is fully invested – the final scenes will show you just how invested – it’s a winning night at the theater from a playwright who had very few losing ones. The New Repertory Theatre production of Arthur Miller’s “Broken Glass.” Directed by Jim Petosa. Scenic design by Jon Savage. Costume design by Molly Trainer. Lighting by Scott Pinkney. Sound design by David Remedios. At the Arsenal Center for the Arts through Sept. 27. http://www.newrep.org.